Cast: Matthew McConaughey, Anne Hathaway, Jason Clarke, Jeremy Strong, Diane Lane, Djimon Hounsou, Rafael Sayegh, Garion Dowds, Charlotte Butler, David Butler, Kenneth Fok, Michael Richard, Robert Hobbs. Rated: (for language throughout, sexual content, and some bloody images). Reviewed by Dustin Putman for TheFilmFile.com, January 30, 2019. A sultry, mysterious, island-set neo-noir. A brain-melting, Bergmanesque rumination on existence. 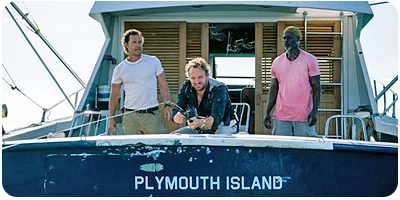 In a sea of cinematic convention, "Serenity" dares to do things differently, to leap from a cliff of the unknown and land where it may. 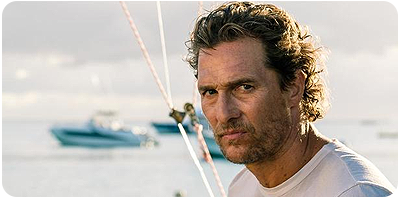 Matthew McConaughey (2017's "The Dark Tower") stars as Baker Dill, a fishing boat captain living on the picturesque tropical island of Plymouth. Desperately missing his son Patrick (Rafael Sayegh), Baker has become obsessed with catching a particularly elusive giant fish. When ex-wife Karen (Anne Hathaway) slinks back into his life unannounced, she comes with a proposition: $10-million in cash in exchange for taking her abusive current husband Frank (Jason Clarke) out on his ship and doing away with him. Baker is against the idea until Karen tells him he'd be doing it for Patrick, increasingly in danger every day he is under the same roof as his stepfather. If it sounds like you've heard this one before and can anticipate where things are headed, think again. "Serenity" is nothing if not excitingly defiant of expectations, writer-director Steven Knight (2014's "Locke") in full, diabolical control over his genre-twisting narrative. From the start, there is an off-kilter portent shadowing Baker, from a nebbish businessman (Jeremy Strong) determined to speak to him and seemingly always a few seconds too late, to a daily local radio report mirroring Baker's day-to-day life, to the appearance of felines everywhere Baker turns, to his daily interactions with locals who know more than they should about private matters happening on the island. Jess Hall's (2017's "Ghost in the Shell") oft-dazzling lensing of Plymouth (filmed on the Indian Ocean island of Mauritius) adds to the atmosphere while finding underlying layers to Knight's cumulative intentions, a sun-bleached paradise with an ominously premonitory underbelly. 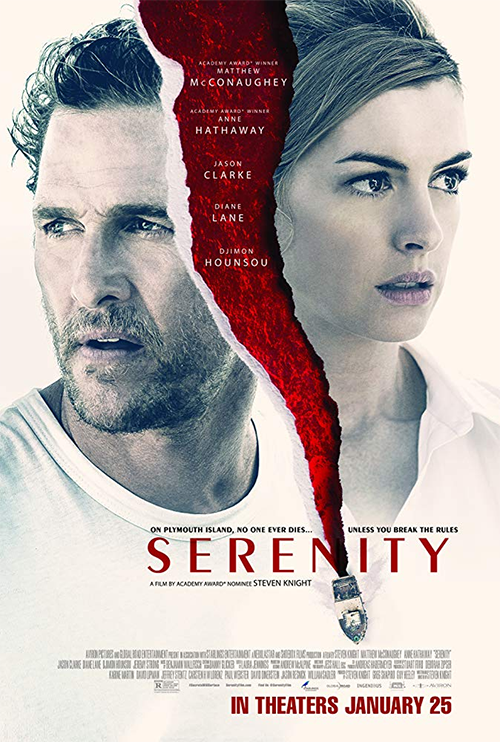 In "Serenity," Baker Dill is a broken soul who will do anything to help his currently estranged son, Karen can no longer stand to be with a violent man who treats the people in his life as his property, and Patrick, glimpsed back home in Miami, frequently retreats to his bedroom to escape the monster lurking on the other side of his door. The deeper one delves into the film's brazen, unconventional pleasures, the more intimate yet expansive its ambitions become, a spiritually haunting meditation on regret, loss, roads not taken, and the desire to make whole again lives which have been torn asunder. A brooding, emotionally captivating Matthew McConaughey and a breathy, touchingly forlorn Anne Hathaway (2018's "Ocean's Eight") are our guides to the intense and reflective goings-on, their performances revealed to be all the more textured as the story peels back each layer. Indeed, this is a film in which its crucial mysteries are intrinsically woven into the very fabric of each frame; anything but cheap or gimmicky, once unveiled they bring revelatory insight to writer-director Steven Knight's shrewd master design. The sooner one sees "Serenity" the better; the daring and wild secrets it holds are simply too bold to risk having them spoiled.